18x24x1 Astro-Sorb PLUS Carbon Merv 13 Welded Wire Pleated | Air Filters, Inc.
Astro-Pleat™ Astro-Sorb™ MERV 13 welded metal wire activated carbon 1-inch air filters provides light to moderate odor control of smoke, pet odors and cooking odors that are absorbed and trapped with in the millions of microscopic carbon pores. With a combination of granular activated carbon (Removing gases and odor's) thermally bonded to the polyester non-woven fibers (Rated for Arrestance of 98% and Dust Efficiency 90%) that offers maximum carbon surface area, consistent carbon distribution with minimal pressure loss. These 1-inch pleated air filters are the highest performing filters (Hospital Grade) available in a residential HVAC furnace systems. MERV 13 filters not only only reduce up to 98% of allergens and microscopic particles for both homes and businesses but effectively eliminate allergies and sinus irritation that can cause watery eyes, itchy throat, coughing, and sneezing. We highly recommend MERV 13 filters for any asthmatics or respiratory sufferers who requirer premium indoor quality in the their home or office. 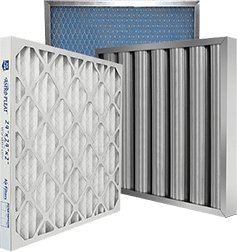 Air Filters, Inc.™ Astro-Pleat™ MERV 13 seasonal 1-Inch pleated air filters effectively reduce/remove pollen, dust, pet dander, dust mites, mold spores, environmental smog and bacteria/allergens from circulated indoor air. Filtering these airborne particles can help alleviate allergies and sinus irritation that can cause watery eyes, itchy throat, coughing, sneezing, asthma or other respiratory ailments. Additional benefits are extending the life of your Air Conditioning / Furnace system by allowing the system to work more efficiently and economically. Air Filters, Inc.™ Astro-Pleat™ MERV 13 seasonal 1-inch pleated air filters use the optimum blend of synthetic fibers to insure high dust holding capacity and filtering efficiency. * MERV 13 seasonal pleated air filters contain 16 pleats per linear foot which creates a greater surface area to catch airborne particles.